KINGSTON : Ulster County Sheriff Paul Van Blarcum wants county residents who are licensed to carry firearms to do just that. 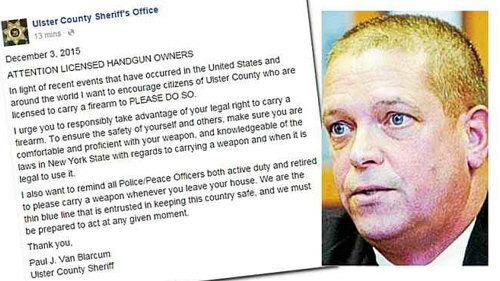 In a post Thursday morning on the Ulster County Sheriff's Office Facebook page, Van Blarcum wrote: "In light of recent events that have occurred in the United States and around the world, I want to encourage citizens of Ulster County who are licensed to carry a firearm to PLEASE DO SO." Van Blarcum, a Democrat who's been sheriff for almost nine years, said in a telephone interview with the Freeman that his call to arms is to ensure "that if something happens, there is an armed citizen around." Despite a lot of approval for this recommendation, there are predictably numerous dissenters. It is those, sadly, who seem to cling to the naive notion that all protection is provided by law enforcement. It is also interesting to note that overall, CCW people very possibly have training and safety skills at or even beyond the level of police, who may perhaps 'train' only once every six months. Extra: - Since the Paris massacre there are moves to try to (even) further limit gun ownership in Europe. The "Double-Alpha Academy" has started the fight against this, by petitioning the Council of the European Union. They need support from all sources.